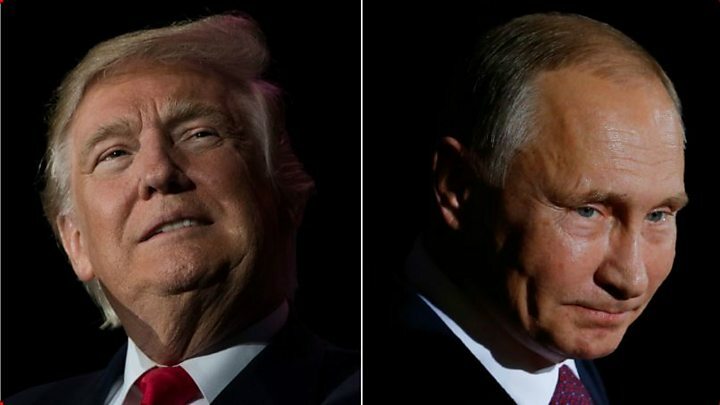 President Donald Trump personally dictated the statement his son gave on his talks with a Russian lawyer during the election campaign, US media report. It said Donald Trump Jr and the lawyer had mostly discussed the adoption of Russian children in June 2016. Mr Trump Jr later revealed he had agreed to meet her after being told he could receive damaging material on Hillary Clinton. President Trump has repeatedly denied any collusion with Russia. The Senate, House of Representatives and a special counsel are all investigating alleged Russian interference in the presidential election which took the form of attempts to undermine Mrs Clinton - a claim denied by the Kremlin. The reports about Mr Trump Jr's statement came in the midst of further turmoil at the White House. White House communications director Anthony Scaramucci was fired on Monday after fewer than 10 days in the post. Reports that President Trump had himself dictated the statement his son issued about the meeting with lawyer Natalia Veselnitskaya first emerged in the Washington Post. It cited multiple sources. 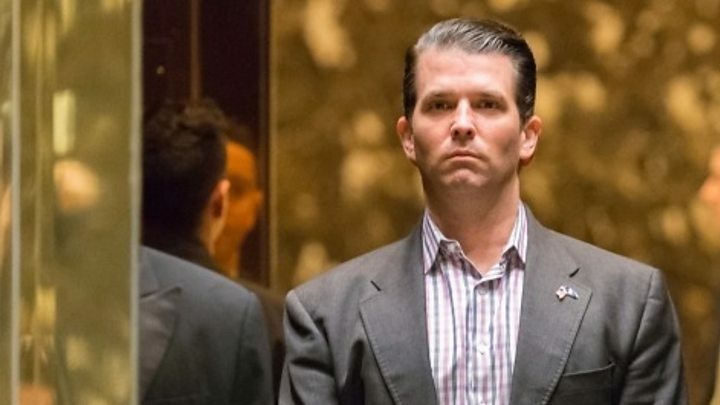 The initial plan was that Mr Trump Jr fully disclose what he knew about the meeting, the Post says, but that decision was reversed and his first statement said they had discussed the adoption of Russian children, not campaign issues. Mr Trump Jr later acknowledged that he had agreed to meet after being told Kremlin-linked information about Mrs Clinton would be offered during the talks. He also released the email exchange that brought about the meeting. The Washington Post says some of the president's advisers fear the extent of the president's intervention could place him and some of his inner circle in legal jeopardy. Did Donald Trump Jr break the law? Why is Trump possibly in legal trouble? According to the Washington Post, Donald Trump thinks that because he didn't do anything wrong, he can't obstruct the criminal investigation into Russian electoral meddling. The president's personal lawyers might want to tell him that's not how it works - and the president might want to listen. Even if misdirecting the media isn't a crime, the Post points out that it's enough to encourage special counsel Robert Mueller to take a closer look. And if the president, who it now appears had a deep involvement in crafting the response to the Donald Trump Jr email bombshell, did more than just help mislead the American public, he could be in legal jeopardy. At the very least the president is playing with political dynamite by not insulating himself from the investigation. It's a lesson President Richard Nixon learned the hard way during Watergate. But then Mr Trump is operating as president the way he did as a candidate - with a small, sometimes chaotic inner circle, where lines of authority are blurred, "expert" advise is often dismissed and all paths lead to Trump. If he - or new chief of staff John Kelly - doesn't change this structure soon, the president may come to regret it. Is Trump closer to obstruction of justice? What do the emails reveal? Mr Trump Jr received an email from an intermediary, British music publicist Rob Goldstone, promising documents from Russia that would incriminate Mrs Clinton. At that time, his father was the presumptive Republican nominee and heading towards an election fight against his Democratic rival. The meeting was reportedly arranged by Russian businessman Aras Agalarov and his son Emin, a pop star who was managed for a time by Mr Goldstone. One email from Mr Goldstone said the information they had been promised was "obviously very high-level and sensitive information but is part of Russia and its government's support for Mr Trump". Mr Trump Jr's response to it was: "If it's what you say I love it." 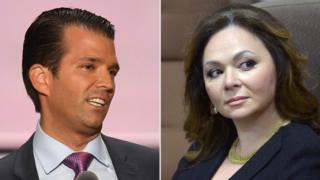 Mr Trump Jr, his brother-in-law Jared Kushner and then campaign chairman Paul Manafort met Russian lawyer Natalia Veselnitskaya at Trump Tower in New York. It became apparent, Mr Trump Jr later said, that Ms Veselnitskaya wanted to discuss a suspended programme for Americans to adopt Russian children. Why was this British guy emailing Trump Jr? Who said what about Russia in Trump's team? What did Trump Jr say about the meeting? Donald Trump Jr told Fox News' Sean Hannity in July that he did not tell his father about last year's meeting: "It was such a nothing. There was nothing to tell. "I mean, I wouldn't have even remembered it until you started scouring through this stuff. It was literally just a wasted 20 minutes, which was a shame." In retrospect, he would have done things a little differently, Mr Trump Jr told Fox News, but he defended his actions. But the meeting went nowhere, he said, and it was apparent Mrs Clinton was not the subject. He could not vouch for the information he was sent, he said. "Someone sent me an email. I can't help what someone sends me. I read it, I responded accordingly, and if there was something interesting there, I think that's pretty common." Melania, Ivanka and Barron Trump - who is the new first family?